Which Type of Foundation Cracks are More Serious? HomeFoundation maintenaceWhich Type of Foundation Cracks are More Serious? Houses slip and slide with the earth beneath them. It can happen over time or can happen suddenly, like with extreme temperature changes. So, it doesn’t matter if your house is old or new—foundation cracks are inevitable. Some cracks, however, can be more severe than others. It’s important to know which types of foundation cracks are more serious in order to prevent slab foundation damage. Just remember, cracks will always get worst over time, so in general it is best to be proactive about your foundation settling, before it gets worse. Check your slab foundation for any cracks or gaps. Even a crack that is 1/16” wide can become a problem because it allows moisture into your slab, compromising its integrity. Hairline foundation cracks are normal and to be expected. However, cracks larger than 1/8” should be carefully monitored. If you have spotted cracks and are keeping an eye on them, be sure to check for other signs of foundation issues including basement wall cracks, crevices in brick exteriors, and doors that start sticking or no longer close correctly. Vertical cracks are wider at the bottom than the top. Cracks that move up and down tend to be associated with soil movement, such as soil expanding and contracting due to extreme weather. Nebraska is known for its extreme weather, so vertical cracks are quite common. If you spot a hairline crack, don’t be worried! Continue to monitor them. If you see that they are getting larger, consult with a foundation repair expert. Horizontal cracks are a bit more concerning. 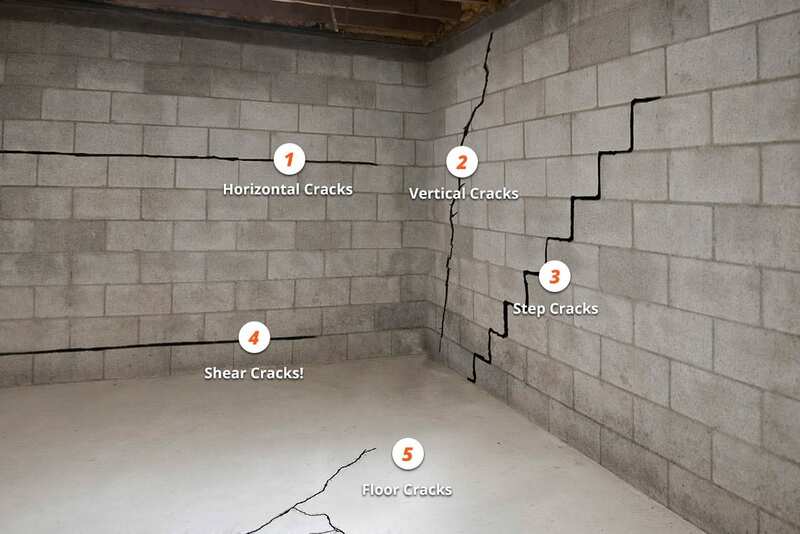 Horizontal cracks can move to connecting walls, leading to potential foundation failure. These foundation cracks can be caused by water or soil pressure, which likely means you have drainage problems or extreme soil movement. This could lead to bowing walls and potentially walls that break. If you spot horizontal cracks in your foundation, basement walls, or brick exterior, call a professional foundation repair company right away. They can lead to serious structural foundation damage and even cause a house to collapse. Most commonly found on slab foundations and brick exteriors, diagonal cracks are from foundation settlement. They are typically 30-75 degrees from an upright vertical position. It can also be caused by concrete shrinkage, meaning your concrete foundation was not mixed properly when the foundation was created. Diagonal cracks, as the name can insinuate, are somewhat in between horizontal and vertical cracks when it comes to severity. Keep an eye on if the gap increases, and if it begins to straighten out horizontally, call your foundation repair company immediately. Similar to vertical cracks, these are often associated with foundation settling. While the soil moves underneath, so does the house. The best course of action is to stabilize your foundation with foundation piers. A foundation repair contractor can assess the amount of foundation piers you will need to have installed. If you have noticed any foundation cracks and are worried about the foundation of your home, contact BDB Waterproofing. We offer foundation repair in Omaha including basement crack repair, foundation piers, and drainage solutions. Call for a free estimate at 402-779-3165.